The following will enable you to identify the series of an Alpine with missing chassis plates. Series I Alpines have only a small chrome guide fillet at the bottom leading edge of the door windows. Open the doors and only the glass sticks more than an inch or two above the body of the door. Series II Alpines have a full height guide channel for the leading edge of the glass. Open the doors and each has a long chrome strip sticking up at the front. Series IV and IVa Alpines have a grill aperture with a single stainless horizontal strip with oval Sunbeam crest badge in the centre. Over the grill and in front of the bonnet, there are chrome SUNBEAM letters. Bumpers are the same type as on earlier Series but are fitted with new style over riders with black rubber facing. At the rear there are vertical taillights. Series IVa. Series IV and IVa cannot be told apart visually, but on manual cars with correct gearboxes, reverse will be on the left on a IV and on the right on a IVa. 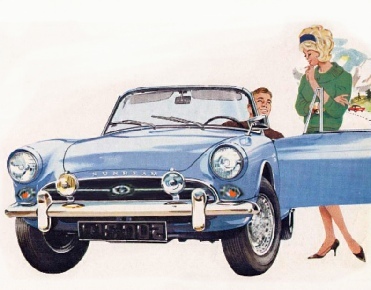 Series V Alpines appears similar to the Series IV but have foot well vents (look for the control knobs marked V on either side below the dashboard) and no SUNBEAM letters on the panel in front of the bonnet. 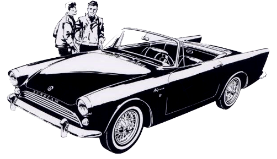 These features changed exactly with a Series change and most are unlikely to have been changed since but many people are fooled by bonnet, door and boot corners, which did not change exactly at the introduction of the Series V.
Bonnet and door bottom rear corners went square late in Series IVa and boot bottom corners did not go square until early Series V.
There are many other minor changes but those listed here are the most obvious ways of identify an Alpine with missing chassis and body plates. It is possible to make a car from one series look like another although there seems to be no point as there are only minor differences in value between series. If you find a car with no chassis plate and you suspect this has been done, the most likely is a gearbox change to turn a IV into a IVa which is often done with no intention to deceive but simply to add the benefit of synchromesh on first. It’s fairly easy to swap the door window guides and screen to make an II look like a I or vice- versa but to fool an expert other changes would have to be made. Other serious bodywork modifications have to be made to change between any of the series or between them and Series 1 and II and any modifications like this needs to be checked with great caution.